Spotlight highlights the work of early-career artists with generous support from the Jerome Foundation. 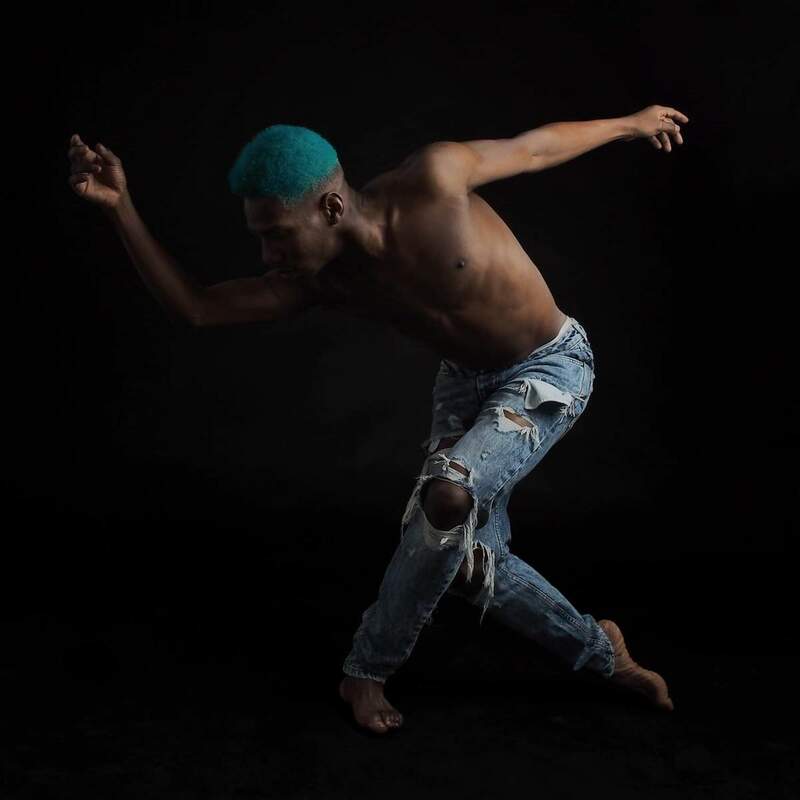 From April 4th through 6th, you can catch Gibney’s first Spotlight Artist of 2019, Omari Mizrahi (Ousmane Wiles), dancing in the world premiere of his work Crossroads. Born in Senegal, Omari began his movement training in West African dance. Since moving to New York, Omari has furthered his engagement with African dance, serving as the assistant director to his mother’s African dance company, while also falling in love with and teaching other styles like vogue, hip-hop and contemporary. Now, Omari continues to integrate these various styles into his choreographic work and shared his first piece Sila Djiguba (Path of Hope) under the company name Les Ballet Afrik at Harlem Stage in May 2018. In this interview with and transcribed by Gibney’s Curatorial Associate Dani Cole, Omari discusses the inspirations for his new work and how he and his company are navigating the New York dance scene through their ongoing process together. Pictured: Omari Mizrahi, Photo by CPGN Photography. Dani: Crossroads, your new work in process at Gibney, is inspired by obstacles in life. Tell me about the conversations you’ve had with your dancers about the obstacles you face. Also, we have talked about our first-hand experiences migrating to New York and entering the New York City dance community. There’s a difference between dancing in the theater, dancing at the clubs or dancing in the many studios. Each dance studio has its own way of teaching, and the students take class in a specific manner. We talk about how welcoming or not welcoming the dance community was when we first came to New York. We discuss how our parents felt knowing that dance was the path that we chose. For me, vogue, something that can be viewed as very feminine and counter to my family’s traditions, coming from a African dance family and background, was far from the path my parents expected me to take. As a company, we discuss and explain how the style of vogue has changed our lives and made us confident. We are more in tune with ourselves and who we are. For me, voguing helped me paint a moving image for my parents and, eventually, enabled them to be at ease with that dancing and how I fuse it with other dance styles. Growing up, I was raised and nurtured by a village of women. For them and now, for me through vogue, femininity is not weak and not an obstacle. Rather, femininity has strength in softness and vulnerability. We talk about how dance alone can change people’s perceptions of you. The fact that in the cast we are all friends—that is a bond in itself. You don’t always meet companies where all the dancers are friends. Dani: What is your company’s process like? We then pair it to music. Initially, we do not worry about the part of the song we set the movement to. Today, we worked on setting it to a specific part of the music and finding what we need to hit in terms of where the movement and musicality can align. That’s how we work—weirdly. Dani: Not weird—that’s wonderful—it starts from a place of community. Omari: Exactly and it’s a conversation. We are not verbally speaking, but each person is throwing in their two cents of movement. That builds this whole conversation that we have with our bodies and among one another. Dani: And the various styles you are incorporating within your process. Omari: Exactly, and the fact that all of my dancers are open to the various styles I am fusing, including vogue, house and contemporary. This means we are all on the same wavelength in terms of where the movement comes from and its intention. Pictured: Omari Mizrahi with two dancers. Photo courtesy of Omari Mizrahi. Dani: How does Crossroads relate to your prior piece, Sila Djiguba (Path of Hope), and how is it different? Omari: In Crossroads, unlike Sila Djiguba, there is more time for space to breathe and more negative space to play with between dancers. The dancers also spend more time in the performance space itself. In Sila Djiguba, everything was closed or happened in tight quarters. It was not as personal and open as Crossroads. Sila Djiguba quickly opened spaces with no time for further interaction. It went down a very specific path and there was no time to waste down this path. In rehearsals for Crossroads, we talk about the styles we are using and how they developed. For example, over time, vogue has become a dance style. Before, it wasn’t even considered dancing. I can put it on stage now—not in its “battle form” or “classroom form”—by really working with it to tell a story without commercializing it. Vogue was initially about storytelling too. In house music, they also tell you a story; it is not just a bunch of lyrics thrown together. It is a message. Now, I get to share voguing and all other social dance styles in a theatrical, music-like kind of way. Voguing can be seen in a contemporary form and not in its underground cypher essence. I don’t want it to just be that. And again, most of my company members are trained in the styles that I am using to create work, but we are also constantly learning from one another. The company members and myself are constantly growing as this piece is growing. I want the audience to know that this is a work in progress and we are a work in progress. Dani: Speak to the guides in your life—dance masters, community members, and support systems. How have they influenced your process? Omari: Hands down—Ronald K. Brown and Ephrat Asherie. Ron was my first inspiration and my guide to life and other styles of dancing, as well as genres of music. His way of fusing traditional and contemporary—or “folk” and Western styles together—was really interesting to me. The fact that he uses a lot of tribal rhythms in his pieces really connected with me because I love Africa. I love everything about my home country Senegal, and I never want to be disconnected from that land. People used to tell me that my vogue looked very African. Well, good! I wanted my vogue to look African, it means it looked different. Ron’s modern dance and the way it moved around space is different. Ron’s way of using repetition in his teaching also affected the development of Crossroads. I am not trying to create a large amount of movement. I am trying to take one small idea and see how far I can expand that movement. How far can I take a ball-change? How does a ball-change look through voguing in femme style? How does a ball-change look in house? How does it look in house when it has a jack? How does it look in modern when there is more extension and line to it? I dance for Ephrat now in her company. She really physically challenges me. I’m exploring that and making my dancers suffer. (laughs) Well, not actually suffer, but I’m physically challenging them and I want to know how I can mentally, physically, and creatively challenge myself. Now I’m like, well god, creatively, what I can I do? How can I push my own vocabulary? How can I push my dancers to do that? How can I get them to dig in and find the fire to pull intensity out? And, of course, my mom and my dad. They will always be inspirations to me. What they’ve done with music through African drums and percussion and what my mom has done with large African dance ensembles is inspiring. My company has nine people and you don’t really see big companies that size in contemporary dance. In the African dance world, that’s a small company. We are thirty people deep in our African dance company in Brooklyn! We have to choreograph and weave people in and out through all of these transitions with thirty people, plus six to ten drummers. This nine person company is actually kind of overwhelming to me because there is so much more space for what I can create. Dani: How are you navigating the New York dance scene as a fairly new choreographic voice? Omari: I think, most importantly, I like to emphasize that Les Ballet Afrik has no company bio. Sometimes, presenters will ask me for a company specific bio and I always ask that they leave it blank. We are in our early stages and there is so much time for our exploration to take root. As I said earlier, in the company, we are constantly learning from one another and creating a language that fuses styles together in Sila Djiguba and, now, in Crossroads. Over time, our blank page will become full with life. No rush. This is only the beginning.